I am able to create 1 mailbox via the solidcp portal. If I then attempt to create a second email address or alias, the \”Domain\” drop down is empty. The domain is no longer listed in the drop down. I hope someone can help. I find it strange that you can create 1 account just fine, but the domain is missing there after. If I delete the first mailbox created, I can then create a new one as the domain is back in the drop down. But then the same issue occurs after you create. Could you please take a screenshot of the overview of the hosting space & when you try create a new domain? I am not aware of this issue but it sounds like it could be quota related. 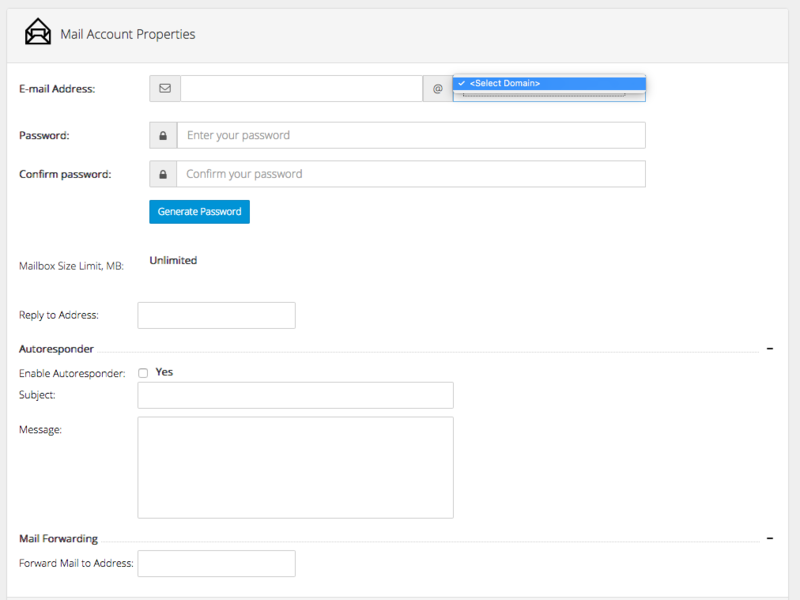 This is the screen to create a new email account after 1 email account has been created. There is no domain to select. If I delete the 1st mailbox, then the domain is available. I Have same issue with hmail , Each time to create an account its needed to choose new domain or subdomain , if you have single domain in the hosting space, its possible to create one email account, also there is same issue to on creating aliases. After removing the pointer from my domain , everything works correctly but I’m not able to recreate the removed pointer and I’ve got the error below that shows the pointer already present. System.Web.Services.Protocols.SoapException: System.Web.Services.Protocols.SoapException: Server was unable to process request. —> System.Exception: Error executing ‘ADD_POINTER’ task on ‘Domain.com’ MAIL_DOMAIN —> System.Web.Services.Protocols.SoapException: System.Web.Services.Protocols.SoapException: Server was unable to process request. —> System.Runtime.InteropServices.COMException: Failed to save object. Another domain with this name already exists.